If the weather outside is frightful, your dog might need a few gear pieces of her own. You’re not about to let a little snow come between you and your training run—and good for you! With the right gear, you can absolutely keep building miles as the temperature drops. But if your go-to running buddy has four legs and a snazzy collar, it’s important that you keep her needs in mind when planning a run. Contrary to what you might think, not all dogs do well in the cold—and even if they do love to run in the snow, there are a few things you can do before, during and after your dog jog to keep your pup healthy and happy through all four seasons. You might be all layered up, but your dog has a fur coat. She should be good to go, right? Maybe—but it depends. Dogs that are low to the ground (like a Chihuahua) and thin dogs with thin coats (like Greyhounds) are more susceptible to cold weather (and therefore more likely to need a sweater or a coat once the temperature drops below freezing) than larger dogs with thick, double coats, like Huskies and Labradors. If you have a thin-coated pup, a pooch who seems to shiver in the cold or if the temperature falls well below freezing, a coat may not be a bad idea—even for a brief walk—but be prepared to take it off during your run if your dog starts panting, recommends Dr. Julia Tomlinson, a Minnesota-based veterinarian specializing in sports medicine and rehabilitation. The cold isn’t the only potential problem for your pup’s paws; there’s also road salt and sharp ice. “If your dog tolerates them, booties are definitely the way to go if you are doing any walking or running where there is road salt used,” Dr. Brown-Bury says. “Some ice-melting chemicals can be toxic if ingested or irritating if in contact with skin for a while, so if not wearing booties, rinsing the paws when you return inside is a good idea.” If you notice any skin irritation, apply a salve designed for dogs to the clean paw pad. Although booties offer protection, Dr. Tomlinson warns that they can cause dogs to slip more. “Use musher’s wax if your dog needs more grip ([if the] snow is not fresh and powdery),” she says. If ice melts and refreezes frequently in your area, pay close attention to your dog’s pads when you come in, says Dr. Brown-Bury, who’s seen plenty of dogs cut their paws on sharp pieces of ice. “But my biggest concern is slipping. We see a lot of dogs with ligament injuries in the winter because they slipped on ice,” she says. It’s also important to keep your own safety in mind. Not only is your dog likely to take you down with her if she slips and you’re attached to her by the leash, but should she be distracted by something like a squirrel and take off while you’re on a slippery section of sidewalk, you could be in for a nasty spill. That doesn’t mean that leaving her off-leash is the best solution though—especially if you live near areas of open water, as dogs don’t understand that the thin ice over a pond might hold a duck’s weight, but not a Doberman’s—and that can lead to a serious disaster. That said, you’d do well to choose your dog-friendly winter running route with caution, and slow down if the surface gets slippery. Just as every human runner reacts a bit differently to changes in weather and temperature, so do dogs. Generally speaking, cooler temperatures do mean your dog can probably hang with you for a little longer than she’d be able to on a hot summer day. “Often, they can work harder and find it easier to cool [in the winter],” Dr. Tomlinson says. 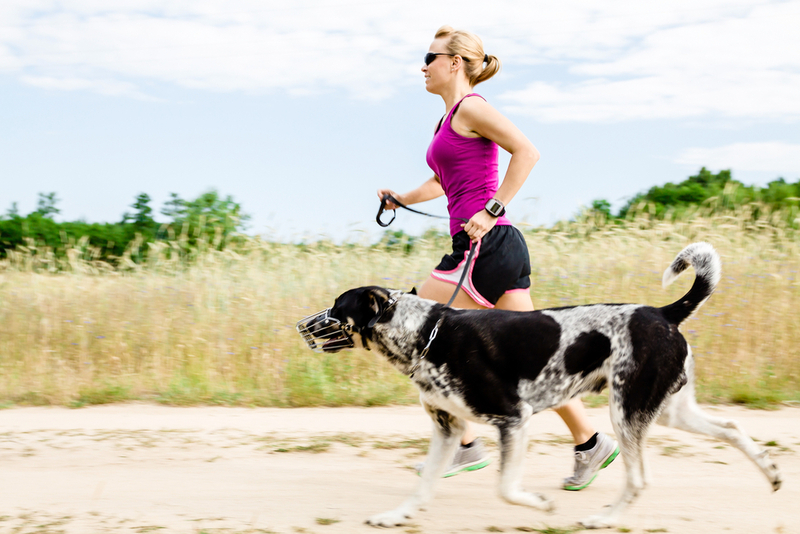 Poor conditioning and well-meaning dog owners unaware that they’re asking too much of their dogs are the biggest mistakes when it comes to jogging with one’s dog, so always pay close attention to their body language before, during and after a run. If your dog is slipping or struggling with her booties, that’s not the time to add another mile. Overheating can be a factor even in the winter, so if her tongue starts looking wider and flatter, it’s time to slow down and/or ditch any layers she might be wearing. The best thing about having a canine running buddy is that, more often than not, you’ve got someone who’s not just willing but straight-up over the moon to go for a run—even if it’s 5 a.m., pitch-black and positively frigid. 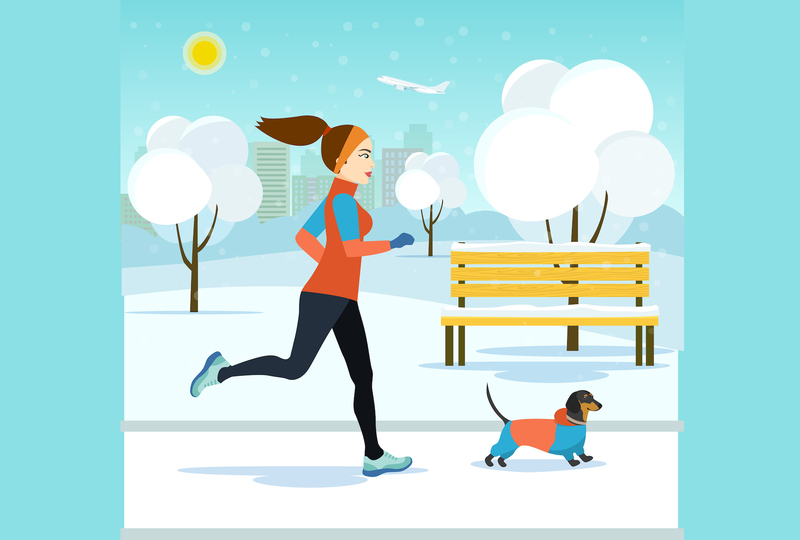 But there may be times when it’s simply too cold for your dog to spend much time outside, in which case opting for the treadmill might be best for you, too. That’s something to keep in mind any time of year. 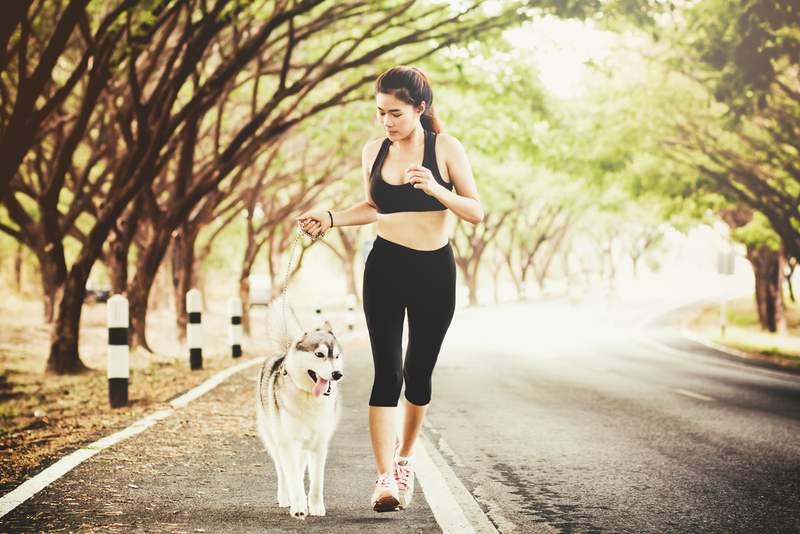 Running with your dog provides her with an awesome opportunity to exercise and it can be a wonderful way to bond, but it’s important to keep your dog’s needs first and foremost when you leash her up. Stopping to sniff a few times—because, hey, they’ve got to check that pee-mail—and making a potty stop or two is important to them, so if you’ve got a key workout that won’t allow for those breaks, find a human friend to join you for that one. You can always go out for a more leisurely cooldown with your best furry friend once you’re done.